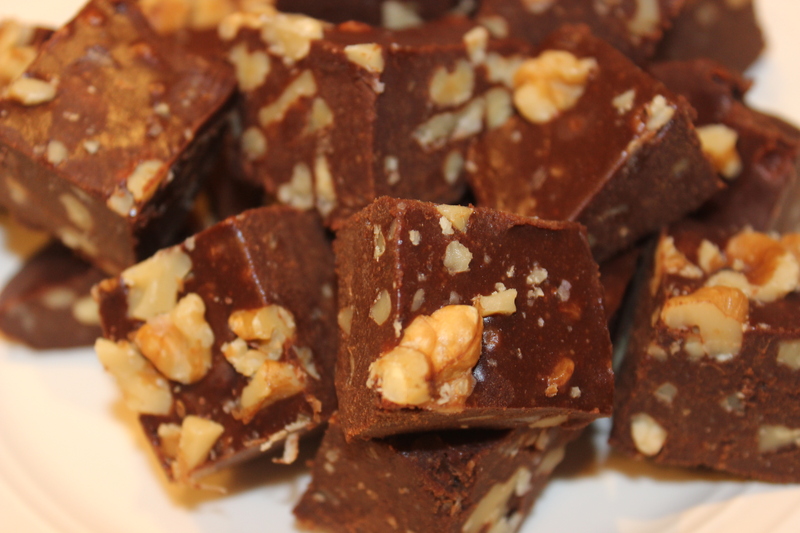 Nom nom seductive raw chocolate fudge…one of my many yummy sweet treats! When we think of “eating healthy,” images of carrot sticks and rice cakes often come to mind. I hope that through reading this blog, you’ve come to expand your view of healthy food and how delicious, fun and exciting it can be! One of the philosophies that shapes my approach to eating, cooking, and baking is the concept of “upgrading and crowding out.” By eating more of the good stuff that nourishes, energizes and heals us, we naturally have less room for the stuff that doesn’t. In today’s post I want to share some of the staples we always have on hand for all of the sweet treat recipes I prepare (that my hubby loves oh so much!). As I mentioned in my previous post about my top 10 (gluten-free, dairy-free) pantry essentials, don’t feel like you have to go out and get ALL of these tomorrow. Why I Love Them: They’re loaded with “keep it movin’ & fill-you-up” fiber as well as dozens of healing, protective, anti-aging, anti-cancer vitamins and minerals (click here for the full scoop on their health benefits!). Not to be confused with “Deglet” dates, which are waxier in texture, Medjool dates are more versatile and flavorful. Dates have become my primary way to sweeten most recipes, as they give sweets a caramel-like texture and flavor…and I LOVE caramel anything. Deglet dates (the ones you’re most likely familiar with) don’t have the same caramelizing effect. How I Use Them: First and foremost, make sure you remove the pit! 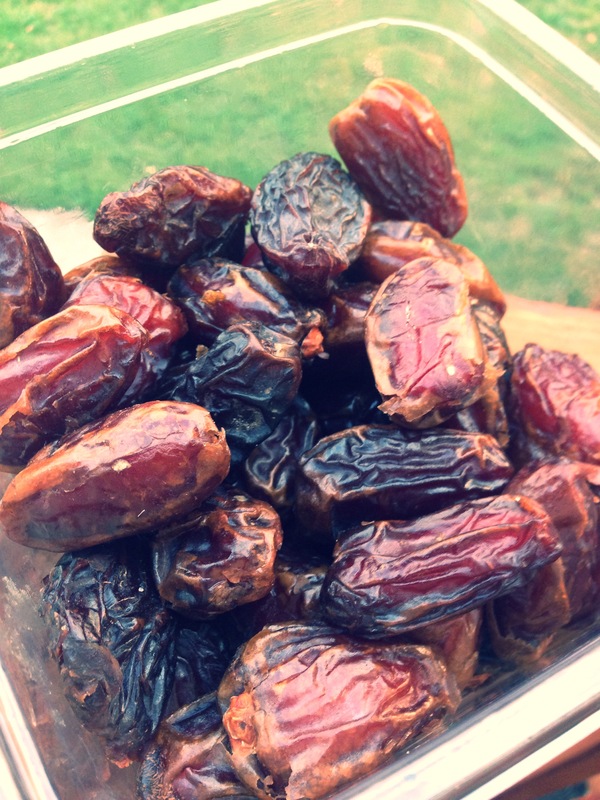 All Medjool dates have pits, so squeeze them open, and take it out before using or eating them. I use dates in a lot of recipes: caramel apple dip, healthy donut holes, homemade fudgesicles, dairy-free cheesecakes, chocolate avocado mousse, and almost every smoothie. One of my favorite snacks is to take a date, split it in half and stuff it with almond butter or peanut butter. You don’t know what you’re missing if you haven’t tried this little bite of caramel bliss! Where to Find Them: I get a big container of Medjool dates from BJs Wholesale Club, as I’ve found that to be cheapest route to go. Trader Joe’s sells them at a pretty decent price, too. You can also get a good deal on them from Nuts.com (worth ordering something JUST to get the super cool, catchy and creative packaging they use!). Most grocery stores carry them, too – some in the dried fruit section and other stores in the produce section. Why I Love It: It has more antioxidants than any other food…and gives many of my desserts their chocolate taste! 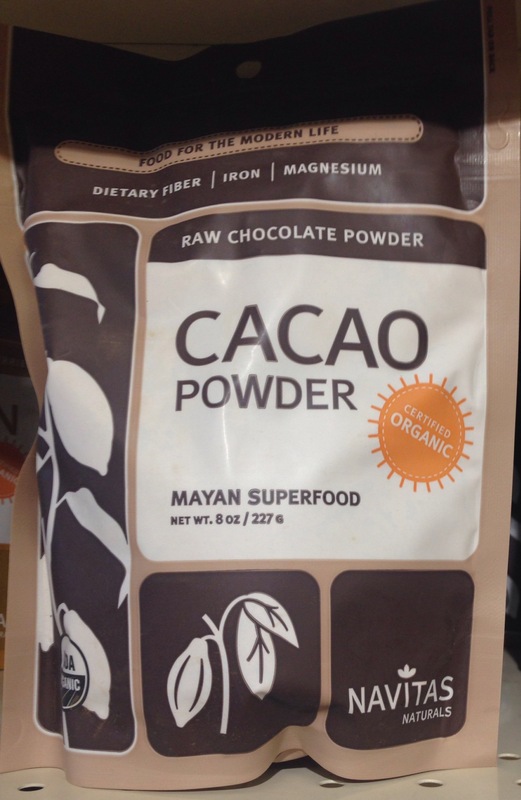 Cacao powder isn’t treated by heat (and therefore damaged) like the more familiar cocoa powder, so its supercharged, health-boosting, disease-fighting antioxidant properties remain intact. Buy it raw and, ideally, organic. How I Use It: Great in raw or cooked desserts. Try my hubby’s favorite Peanut Butter Cup smoothie or Chocolate-Covered Strawberry smoothie, Chocolate Avocado Mousse, Fudgesicles, Divine Chocolate Peanut Butter Dip, No-Bake Chocolate Fudge, Homemade Rolos, or 2-minute peanut butter chocolate ice cream. Where to Find It: Wegmans, Whole Foods, and any natural food store like MOMs Organic Market. We get ours online through Amazon Prime. I’ve found that it’s cheaper to buy it on Amazon or Vitacost instead of at the store, unless it’s on sale. This is another product that Home Goods has sometimes, so check out their pantry section the next time you’re there to see if they have it. Why I Love Them: Known for their anti-inflammatory, disease-preventing, and fat-fighting (AKA GBOMBS!) properties, flaxseeds keep our brain, heart, and joints healthy due to their Omega-3 fatty acid content. Since our body doesn’t produce Omega-3 fatty acids on its own, we need to make sure we’re incorporating them into our diet. 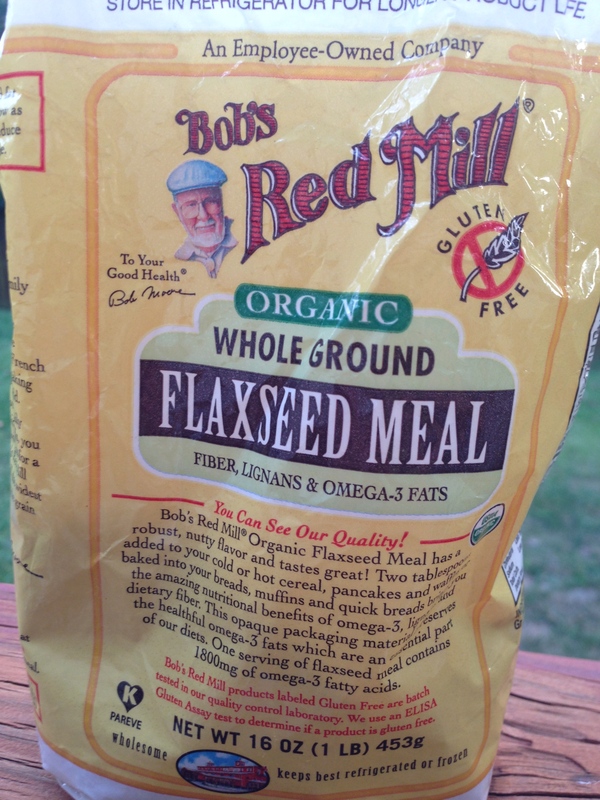 Flaxseeds have a nutty flavor and are loaded with fiber, which helps regulate blood sugar (a key to staying energized! ), keeps us feeling fuller, and promotes healthy digestion. Flaxseeds are also a great anti-PMS food because of the lignans they contain, which help balance our hormones. If you buy the whole seeds make sure you grind the seeds before eating them or they will pass through your body undigested. How I Use Them: You can create something called a flax egg and use it as a substitute for whole eggs in certain recipes. I put a couple of teaspoons of flaxseeds in my morning smoothies, including this seasonal Pumpkin Pie Smoothie and Peanut Butter Cup Smoothie Shake and use it in other sweet treat recipes, including Chocolate Chip Cookies, Chocolate Walnut Brownies, and No-Bake Fig Newton Bites. Remember, all of these recipes are also gluten-free and dairy-free! Where to Find Them: Most of the major grocery stores, every health food store, Trader Joe’s, Whole Foods, and Wegmans all sell flaxseed. I’ve also had luck finding them in the food section of Home Goods, Amazon, Vitacost and Nuts.com are always options as well! Why I Love Them: Dr. Joel Fuhrman, one of the most respected nutrition experts in the world, classifies nuts as one of his GBOMBS foods (the second “S” stands for seeds and nuts) for their anti-inflammatory, anti-fat storage, disease-fighting compounds. They are a great source of heart, brain & joint health-supporting fats and contain fiber and protein to keep us feeling full and satisfied. Buy them raw/unroasted because they take on different flavor when roasted that changes the taste of a dish (especially cashews) . How I Use Them: In a LOT of recipes! You can toss a few teaspoons in to your morning smoothie, sprinkle them on top of a salad or a jar of overnight oats, toast them and add them to sautéed vegetables or greens. If you have trouble digesting nuts, try soaking them in water overnight before adding them in to dishes, as that makes them easier to digest. 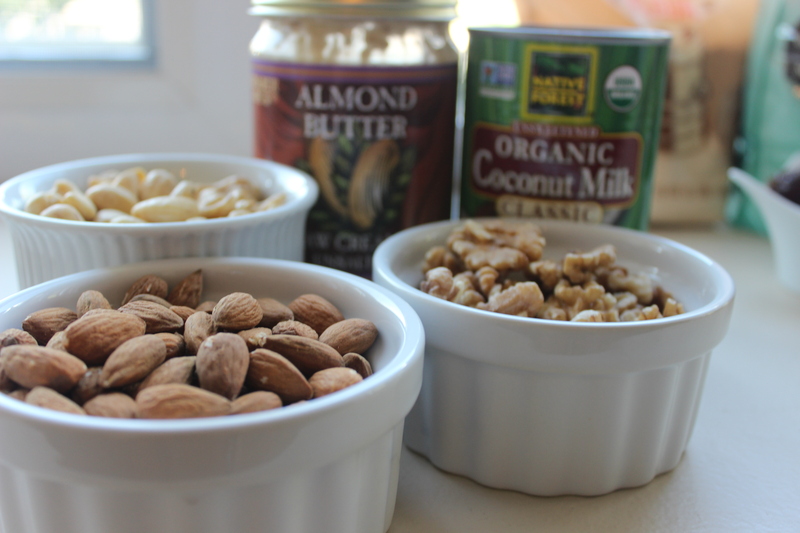 Cashews: These are one of my MAIN sources of making desserts, smoothies, and even cheesecake taste creamy, decadent and satisfying without using dairy! The key is buying raw cashews and usually soaking them in water overnight. Try these recipes: My FAVE parmesan cheese substitute – Paleo Parmesan Cheese, Caramel Apple Dip, Dairy-Free Nacho Cheese Sauce, Mini-Cheesecakes (DECADENT alert! ), and Peaches ‘n Cream Smoothie. Walnuts: Seductive Raw Chocolate Walnut Fudge, Homemade Donut Holes, Simply Amazing Chocolate Walnut Brownies, Upgrade Kale Waldorf Salad, Zucchini Basil Pesto, and No-Bake Fig Newton Bites. Almonds: Quinoa Almond & Apple Potluck Salad, Garlicky Lemon Green Beans, Ooey Gooey Berry Peach Crisp, Dairy-Free Cheesecake Crust, Donut Holes and Fig-Newton Bites. Where to Find Them: All grocery stores sell them, but Trader Joe’s and Nuts.com appear to sell them cheapest. Wegmans also sells big containers of raw nuts, and I just got a giant container of raw cashews there that will last awhile! I store all of my seeds and nuts in glass jars in the fridge to prevent the oils in them from going bad. Why I Love It: We’re not talking about the super processed Log Cabin or Aunt Jemima stuff you grew up pouring on pancakes. Those maple-flavored syrups contain lots of highly processed sugar called high fructose corn syrup (HFCS) and other chemical additives as well…basically not real food ingredients. 100% pure maple syrup has a darker color and richer flavor but also has some minerals and antioxidants intact. Keep in mind that it’s still sugar, which is something we should limit our intake of, but on a scale of “good, better, best,” it’s a better choice than pure white table sugar. 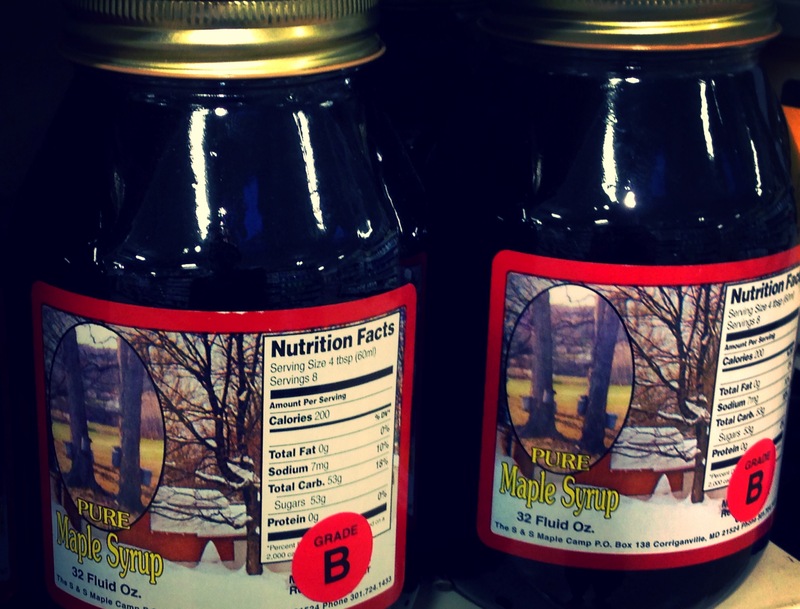 Click here for the full scoop on maple syrup from Authority Nutrition. How I Use It: In addition to raw honey, we use maple syrup as our primary sweetener in sweet and savory recipes. It has turned a Brussels sprouts hater into a lover with this recipe, and I’ve used it to sweeten everything from decadent chocolate mousse and Peanut Butter Bliss balls to the sweet and tangy dressing for my favorite kale salad. Where to Find It: Every grocery store sells 100% maple syrup, but I’ve had to look a little harder to find the good Grade B kind, which is deepest in color and flavor and best for baking. I usually buy a 32-ounce jar at MOMs for about $14 (see picture above!). It lasts for several months, so I don’t mind spending the money. Trader Joe’s also sells Grade B syrup. Why I Love It: Since cutting out dairy, I’ve had to find alternatives to cow’s milk, and this stuff is a great option. Coconut milk is rich, creamy, and incredibly satisfying. It’s high in saturated fatty acids and medium-chain triglycerides (MCT), which are both easily burned by the body as fuel. MCTs are especially beneficial because bile acids (which we usually need to break down fats) aren’t needed to digest them. How I Use It: In SO many recipes from one of YOUR favorite recipes, the Set-It-And-Forget-It Comfort Food Casserole, to fudgesicles, frittatas, dairy-free cheesecakes, and coconut whipped cream. Coconut milk gives food a really deep, rich flavor and adds a nice creamy texture to any dish. We always have a few cans in our pantry! 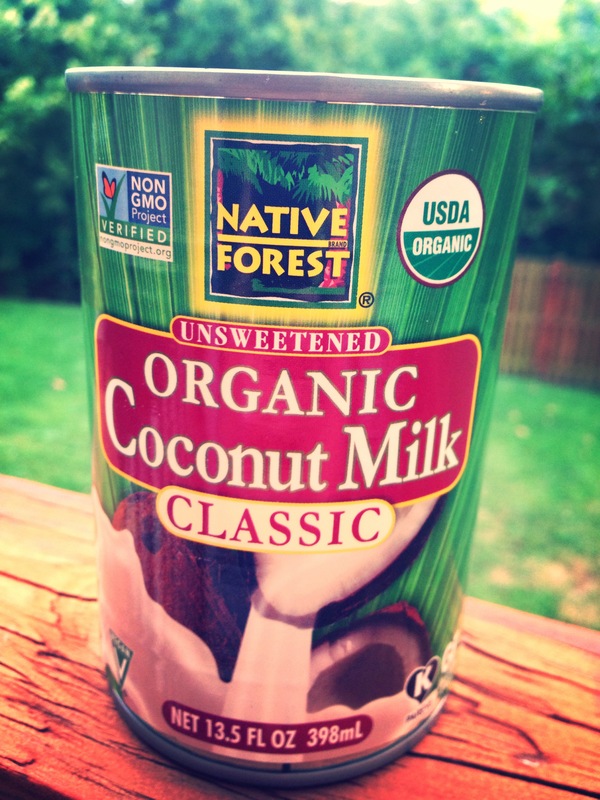 Where to Find It: Every grocery store sells coconut milk, and you can find it at stores likes Target, too. It’s usually in the international foods aisle or in the natural foods section. Buy the canned stuff (not the coconut milk in the refrigerated section of the store). The best brand to buy is Native Forest because their cans are BPA-free. BPA is a chemical found in the lining of canned foods that makes its way into the food, so whenever you buy canned goods look for the words “BPA-free.” Also, buy the full fat kind. You can always thin it out yourself with water if you prefer it thinner. Check out this post by Chris Kresser for more info on coconut milk…even how to make it yourself! Why I Love It: I should start by saying I used to HATE coconut. Yup, whenever I got those little Almond Joys or Mounds in my trick-or-treat bag as a kid, into the trash they went. It’s only been in the past 3-4 years or so that I’ve taken to coconut in all forms, but I use it in lots of recipes. See the info in the coconut milk blurb above, but also know that shredded, unsweetened coconut is a healthy, natural sweetener to use in recipes because it won’t spike your blood sugar like white sugar will. Coconut also contains high amounts of two fatty acids that have anti-viral, anti-bacterial, anti-septic and anti-fungal properties. How I Use It: Simple ways to use shredded or flaked coconut are to toss it in with some homemade trail mix, onto your overnight oats, or into your morning smoothie, or even toast it and toss it onto a salad. I use shredded coconut in my kid-friendly healthy donut holes and Caribbean island breeze smoothie. Where to Find It: The brand I recommend is “Let’s Do Organic.” You can find it at Wegmans, Whole Foods, MOMs Organic Market, any natural food store, or online at Amazon, Vitacost, and Nuts.com. 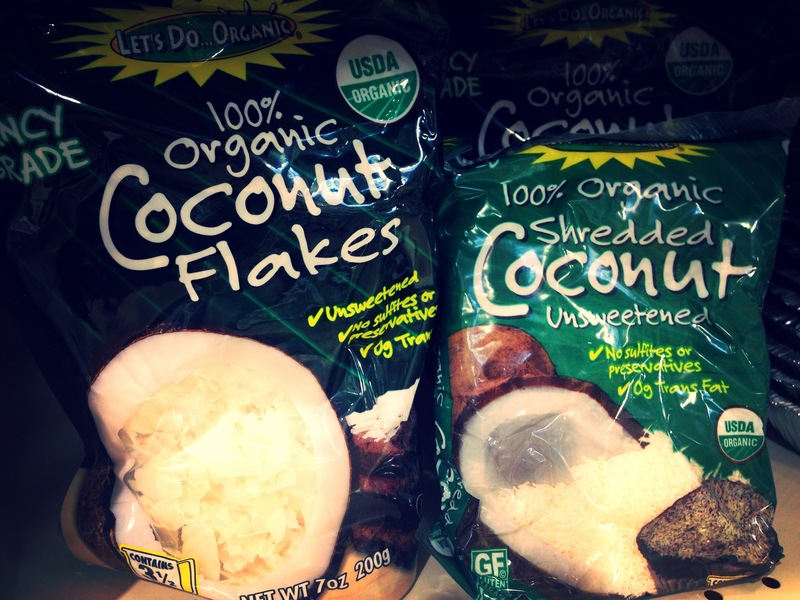 They sell shredded coconut at every grocery store (usually in the baking aisle or health food aisle) and also at places like Target – just make sure you buy the unsweetened kind! Why I Love It: This has been a staple in our pantry for years, and we always keep several jars on hand. Almonds are a great source of protein, healthy fats (food for our brain, skin, heart, and joints! ), as well as several other vitamins and minerals like magnesium, vitamin E, and manganese. It’s best to buy almond butter in its RAW form, which means it hasn’t been heat-treated to high temps and is closest to its natural form (AKA blended almonds). How I Use It: I love this stuff! I’ll add a tablespoon to my morning smoothies for some creaminess, use it in my Gluten-free Dark Chocolate Chip Cookies, No-bake Chocolate-covered Cookie Dough Bites, Healthy Donut Holes, Berry Quick Overnight Oats, and Raw Almond Butter Cups. To avoid the oil-dripping-over-the-sides-headache when you first open it, store the jar upside down when you first bring it home. When you’re ready to use it, open the jar and stir – the oil will already be partially blended, which will save you from a giant mess! Where to Find It: By far, the BEST place to buy raw almond butter at the lowest price is Trader Joe’s. About a year ago, I got word that they were discontinuing it and switching manufacturers…and subsequently bought 8 jars of it, thinking they would be my last. Fortunately, they didn’t discontinue it! Yay! 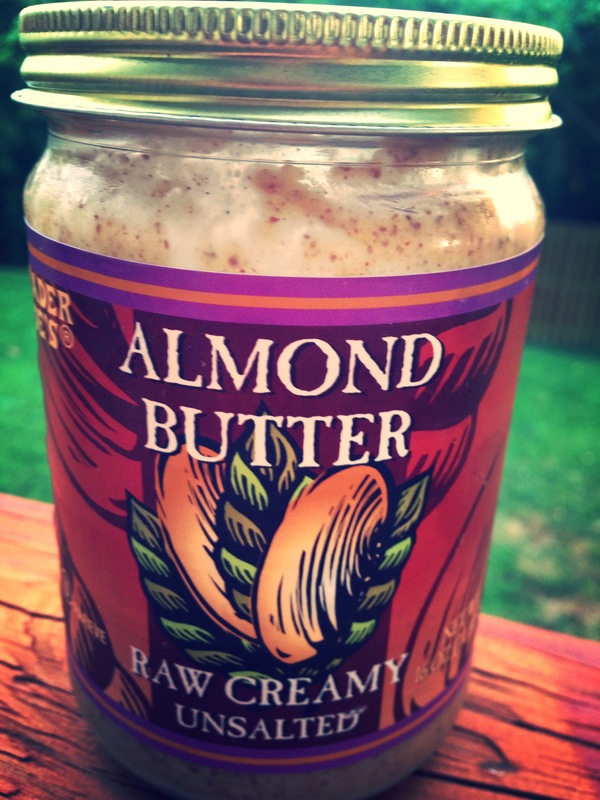 Trader Joe’s raw almond butter sells for $3-$7 less PER JAR than almost any other raw almond butter out there. In other words, it’s worth the trip to TJs to get this stuff. Why I Love Them: Oats are most known for their high fiber content and its ability to help remove cholesterol from our digestive system that would otherwise end up in our bloodstream. The fiber content in oats also helps stabilize blood sugar, which directly translates into how energized we are (stable blood sugar = stable energy). Oats also contain a wide range of vitamins and minerals that give our body the nutrients it needs. For all of those reasons, oats have been tied to healthier hearts, reduced risk of disease like diabetes and cancer, and more stable energy. For information about all of the health benefits of oats, click here. How I Use Them: I use oats most commonly in breakfast foods like these berry and pumpkin pie overnight oats as well as to thicken drinks like this PB&J smoothie, make a crust for this berry peach crisp, or in these decadent Peanut Butter Granola Bars. 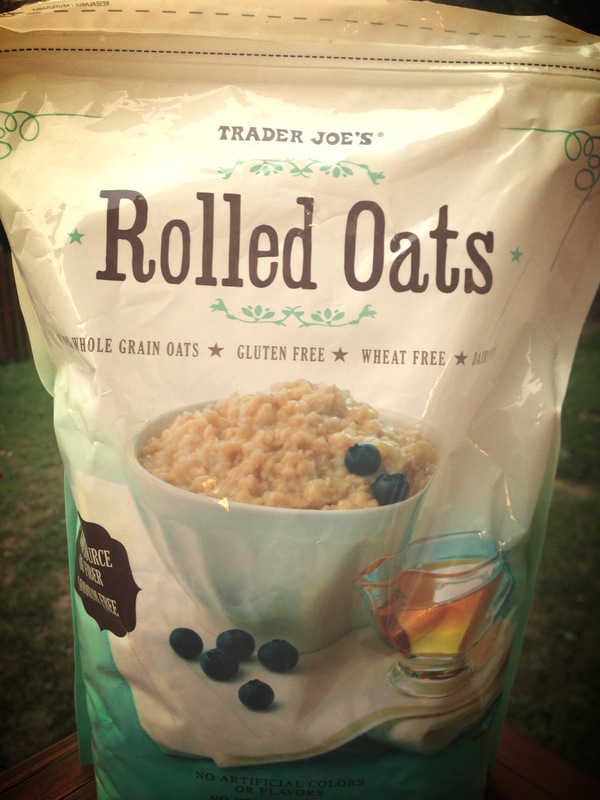 Where to Find Them: I buy a big bag of gluten-free rolled oats at Trader Joe’s and they last me a long time. Oats have a high likelihood of being “cross-contaminated” by wheat because of where they’re processed, so be careful when selecting oats if you’re sensitive or allergic to wheat. You can find rolled oats (NOT instant or quick oats) at any grocery store or online at Amazon or Vitacost. Why I Love It: Since we cook and bake without using gluten (found in traditional white and wheat flours), this stuff really comes in handy. Not only is coconut flour gluten-free, it’s also a good source of dietary fiber, safe for diabetics (won’t spike your blood sugar! ), high in healthy fats and packed with protein. For even more info about why you should get to know this ingredient, check out this article from Food Matters about the Health Benefits of Baking with Coconut Flour. How I Use It: In baking recipes. It’s NOT a 1:1 substitution for regular flour, so be sure to follow recipes when you start using it. Most paleo recipes (i.e., no beans, grains, dairy, or refined foods) use it as the primary baking flour in addition to almond flour (another great choice for your pantry!). I used it in these Strawberry Lemon Cupcakes, these decadent Chocolate Peanut Butter Bliss Balls and in a pumpkin muffin recipe I will be posting later this week! Where to Find it: This stuff is popping up at more stores each day. 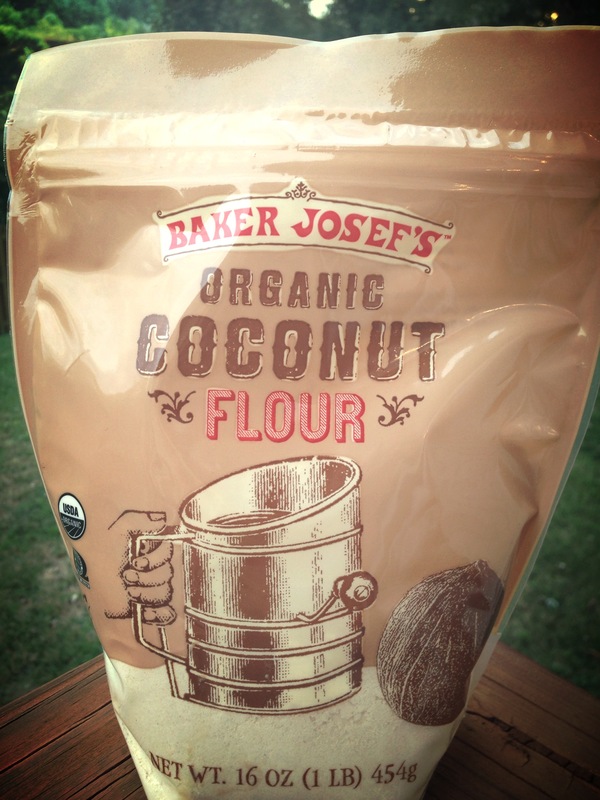 Trader Joe’s sells organic coconut flour for $2.99/bag, so that’s where I’ve been getting mine. Whole Foods, Wegmans and MOMs or Roots will carry it, as will any natural food store. I’ve started seeing it in the more mainstream grocery stores in the gluten-free aisle. You can also order it online at Amazon, Vitacost, or Nuts.com. I’m also a big fan of having almond flour on hand, so check out those same places to buy almond flour. Why I Love Them: These are one of the most “processed” foods we keep around the house. I like them because they’re 1) allergy-friendly (no wheat/gluten, dairy, peanuts, soy, eggs, tree nuts), 2) not genetically modified, and 3) don’t have artificial anything. The only ingredients are unsweetened chocolate and cane sugar (yay for 2 ingredients!) 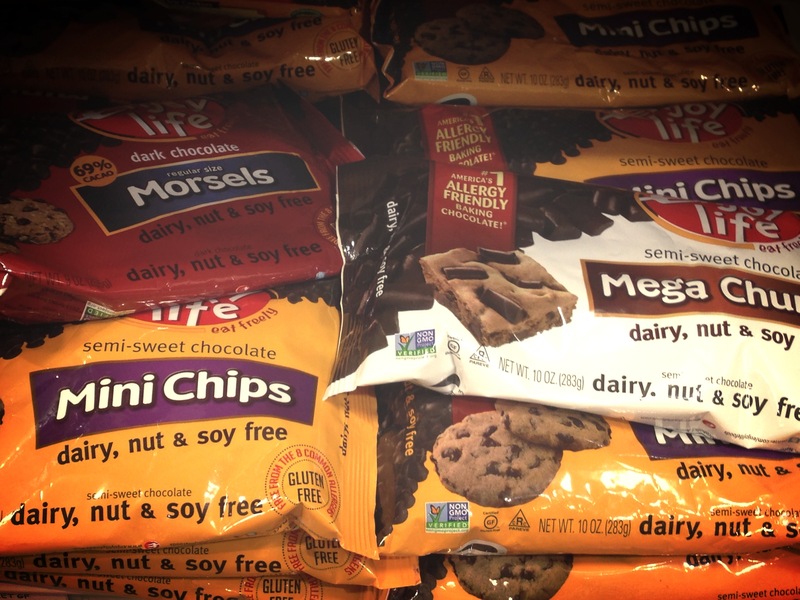 vs. Nestle morsels, which contain Sugar, Chocolate Cocoa Butter, Milkfat, Soy Lecithin, Natural Flavors. I’m all about “upgrading” recipes and finding better alternatives to common foods that we love. How I Use Them: I might use them in a recipe once a month – again, sparingly – but it’s nice to have an option when a recipe calls for chocolate chips 🙂 I used them in just about every recipe featured in my 5 Favorite Sweet Treats post as well as in Chocolate Peanut Butter Bliss Balls, No-Bake Cookie Dough Bites, the Easiest Chocolate Chip Cookies You’ll Ever Make, AND in one of the best recipes I’ve ever made – Mini Deliciously Dairy-Free Cheesecakes! Where to Find Them: In the gluten-free or baking section of Wegmans, Target, MOMs and Whole Foods. I’ve found them cheapest at Wegmans or at MOMs if they are on sale or I have a coupon. Use this link on their website to find which stores sell them near you. Did you like this post? Find it helpful? I love hearing from you and knowing what you think, so feel free to leave a comment below and share this with your family, friends and Facebook!